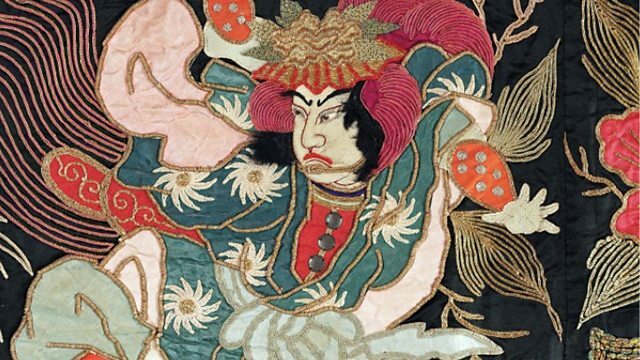 Was this vibrant robe worn by a Japanese courtesan? Cathy FitzGerald visits the floating world to find out. Each thirty-minute episode of Moving Pictures is devoted to a single artwork - and you're invited to look as well as listen, by following a link to a high-resolution image made by Google Arts & Culture. Zoom in and you can see the pores of the canvas, the sweep of individual brushstrokes - or in this case, the pull and pucker of every stitch. From the collection of The Victoria and Albert Museum. From the collection of the National Gallery, London. From the Collection of the Art Institute of Chicago. Zooming deep into paintings by Bruegel and Rachel Ruysch, and a Japanese screen.